Sarah Palin, the ex-Alaska governor who served as John McCain's running mate when he ran for president in 2008, is reportedly banned from his funeral. According to US media, the request to Mrs Palin - who Senator McCain later regretted selecting - was sent through a family intermediary. A Palin "family source" told NBC News that "out of respect" to the family, "we have nothing to add at this point". 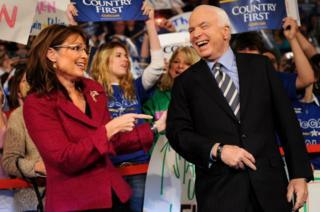 Mrs Palin was unveiled as McCain's running mate exactly 10 years ago. 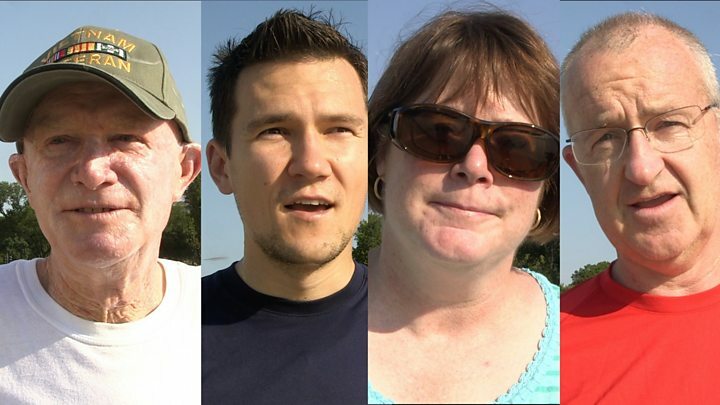 "The Palin family will always cherish their friendship with the McCains and hold those memories dear," the family representative told a reporter on Wednesday. The 81-year-old Arizona Republican senator and former Vietnam prisoner-of-war died last Saturday after a battle with brain cancer. In a pair of tweets after the death, Mrs Palin praised her former running mate as "a maverick and a fighter, never afraid to stand for his beliefs". "John McCain was my friend," she wrote. "I will remember the good times. My family and I send prayers for Cindy and the McCain family." 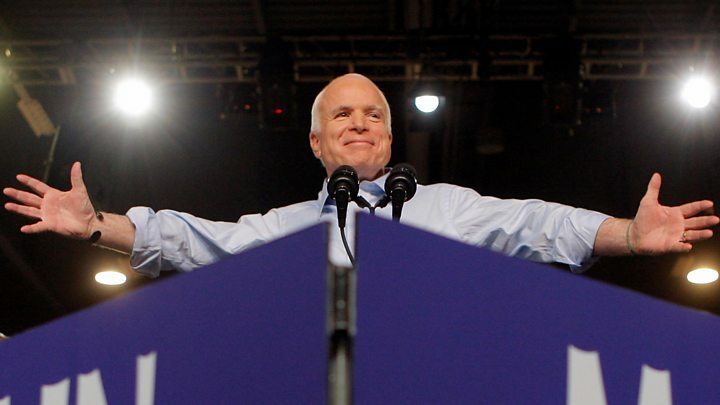 A McCain family source told People magazine on Wednesday that the decision probably came from his widow, Cindy McCain. "She is very protective of John's memory and legacy. She's also a grieving widow. I think she wants to get through this as best she can," the unnamed source said. According to the magazine, stay-away messages were conveyed through an intermediary to Mrs Palin. Carla Eudy, a fundraiser who worked with the McCain family for decades, told the magazine that "invitations were not extended" to either Mrs Palin or US President Donald Trump. The relatively unknown Alaska politician rocketed to fame after she was selected by Mr McCain in 2008 as his vice-presidential running mate. In May he published a book, saying he regretted choosing Mrs Palin and should have instead picked his friend and former Democratic senator Joe Lieberman. Mrs Palin said at the time that his words, which were published in McCain's memoir The Restless Wave, were "a gut punch". She added that his comments hurt "a bit", but encouraged the ailing senator to find some "positive aspect in decisions that he's made in the past - even about that campaign". Media captionVisitors to the Vietnam memorial in Washington DC paid tribute to John McCain. McCain's body arrived at a Phoenix, Arizona, church on Thursday for a commemoration led by former US Vice-President Joe Biden. 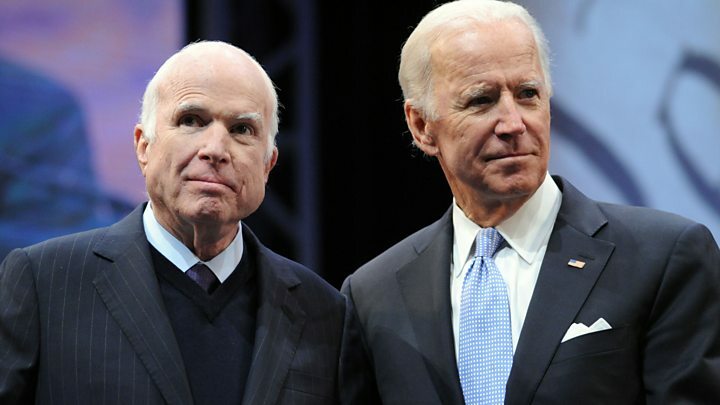 Mr Biden, a friend and former six-term Democratic senator from Delaware, described McCain in an emotional speech as a brother, "with a hell of a lot of family fights". "John understood that America was first and foremost an idea, audacious and risky, organised around not tribe, but around ideals," he said. Mr Biden added that McCain "could not stand the abuse of power wherever he saw it, in whatever form, in whatever country". On Wednesday, several thousand people queued for hours in the blazing Arizona heat to pay final respects to him as his coffin was displayed inside the Arizona Capitol rotunda. A funeral service will be held in Arizona for him on Thursday before his coffin is transported to Washington where he will lie in state at the US Congress. On Saturday a service will be held at Washington's National Cathedral. Former Presidents Barack Obama and George W Bush - each of whom beat McCain in his twin presidential campaigns - will deliver eulogies, and so will former Secretary of State Henry Kissinger.